Karen Davidson safeguards her late husband’s legacy — including Israel’s new Hadassah Hospital tower. The Sarah Wetsman Davidson Tower at Hadassah-Hebrew University Medical Center at Ein Kerem, Israel. A small-town Indiana girl, daughter of a house painter and a teacher, flies to Israel for the 23rd time today (Oct. 11). 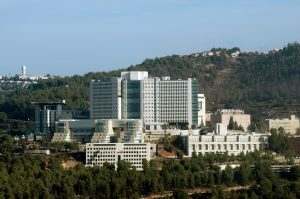 There she’ll help fulfill the dream of her late billionaire husband by dedicating the largest construction project in Israel in honor of his mother — the Sarah Wetsman Davidson Hospital Tower at the Hadassah-Hebrew University Medical Center at Ein Karem, a suburb of Jerusalem. Karen Davidson of Bloomfield Hills, widow of businessman-philanthropist Bill Davidson, will join with several other Davidson family members in the dedication Sunday, Oct. 14. “Bill loved his mother, and he would have loved to be with all of us at this great occasion,” Karen said. “We’re all excited about the trip and the ceremonies Sunday. 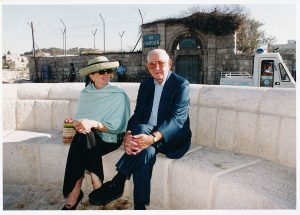 Among those making the trek to Israel are Bill’s sister, Dorothy Gerson, and her husband, Byron “Bud” Gerson, of Franklin, and their son and daughter-in-law, Ralph and Erica Gerson of Bloomfield Hills. Not attending are Bill’s son Ethan Davidson, who disdains flying, and Bill’s daughter, Marla Karimipour, who has two small children. Ethan’s wife, Gretchen, will attend. Karen will stay for several days of dedication festivities and also to attend some meetings continued involving other of Bill’s business and philanthropic interests, mainly the Weizmann Institute of Science in Rehovot. “I want to make sure Bill’s philanthropies are being taken care of properly,” she said. Actually, the tower, being built in four phases, won’t be completed until 2014, but Hadassah officials wanted to hold dedication ceremonies while its members are in Israel from around the world to attend the 100th anniversary celebration of the women’s Zionist organization. Jon Aaron of Bloomfield Hills, who is Karen’s son-in-law and chairman of the Davidson Foundation, kept track of construction during several trips to Israel. “It was a great pleasure to witness the progress and then be there to see the first patients arrive,” he said. 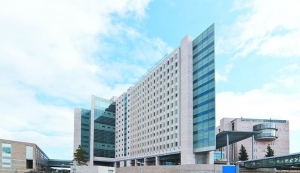 The Sarah Wetsman Davidson Tower at Hadassah-Hebrew University Medical Center at Ein Kerem, Israel, honors the mother of the late Bill Davidson and Dorothy Gerson of Franklin. The 19-story tower, which rises high above the campus, will be dedicated Oct. 14, during Hadassah’s 100th anniversary celebration. The tower is 19 stories high, with 14 stories above ground and five stories below for security reasons. There are 500 beds, 20 operating rooms, 60 intensive care units and an ultra-modern heart institute. Among the other features are stem-cell treatment, gene therapy, use of robotics and computer-guided surgery. Phases One and Two, mainly the structure, are completed; Phase Three is being worked on, and Phase Four will start soon. Phases Three and Four consist of operating rooms, intensive care units and additional underground work. The Oct. 14 dedication will honor the Davidsons and other major donors, and an Oct. 16 program will honor all other donors. An Oct. 18 event at the city’s convention hall will fete about 1,500 Hadassah members in town for the centennial celebration. Bill Davidson launched the project in 2007 with a $75 million gift from himself, Karen and Guardian Industries Corp. of Auburn Hills, the company that he nurtured into becoming one of the world’s largest manufacturers of automotive and architectural glass, with $5 billion in annual sales now. Bill gave the $75 million directly to the State of Israel to assure the tower would be built and not delayed by economic downturns. About $305 million has been raised from other sources so far toward the goal of $360 million from other sources, according to a Hadassah development spokesman. “The Davidson family gift, of course, is the largest, but we’ve received many $1 million gifts from people in the U.S., including Michigan,” he said. When Davidson died at 86 of complications from pneumonia on March 13, 2009, his wealth was estimated at anywhere from $2.1 to $3.5 billion by Forbes magazine and other financial sources. He had donated more than $200 million in his lifetime to worldwide institutions and causes, much of it to Jewish organizations and causes. “Many people think Bill made his money from owning the Detroit Pistons (the National Basketball Association franchise), but he did it through 50-60 years of hard work and business acumen,” Karen pointed out. Karen philosophized about Guardian and other subjects as she sat in the living room of the modern home on Lahser Road that she took about five years to help design. The contemporary home probably should be measured in square feet of glass rather than floor space. “Officially, the architects were Young and Young [in Bloomfield Hills], but unofficially, the house was designed by a group of Guardian glass engineers,” she quipped. The only Davidson family member in a high position at Guardian is Bill’s nephew, Ralph Gerson, who is executive vice president. “Bill didn’t believe in placing family members in the business just because they were related to him; he felt people should get jobs based on merit,” she said. Karen is now on the boards of eight companies or organizations, plus several committees, and maintains a pretty hectic schedule. “When Bill died, Karen had a lot to learn about the business side of his life,” said Robert Kennedy, executive director of the William Davidson Institute at the Ross School of Business at the University of Michigan. It’s a far cry from the quiet upbringing of Karen Weidman, who was born in 1949 in the small town of La Porte, Ind. (population 22,000), just west of South Bend. She attended boarding school in Oregon, then graduated from U-M with a biology degree. She met her first husband in California “and I settled down to raise three children,” she said. They are Elizabeth Reaser, an actress with 30 movies and television shows to her credit, including the popular Twilight saga, with her next movie, Liberal Arts due out soon; Emily Reaser, who also is single; and Mary Aaron, married to Jon, with four children. Jon Aaron is a former Guardian employee who now works full time settling Bill’s estate, which still is not finalized almost four years after his death. Large amounts of money are released periodically to the family and the Davidson Foundation as various governmental requirements are satisfied, and $1 billion reportedly was released recently, according to Karen Davidson, the foundation’s treasurer. “The estate seems to have taken on a life of its own,” Karen said. “The government is always asking for more information, sending us forms to fill out and so forth. 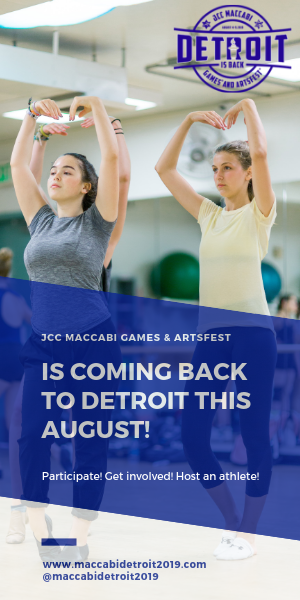 But the foundation, composed mostly of family members, has made grants without much fanfare to the Jewish Federation of Metropolitan Detroit ($1 million), Congregation Shaarey Zedek in Southfield ($500,000) and several Detroit cultural and educational institutions. Bill was a longtime member and past president of Shaarey Zedek. Karen and Bill met on a blind date and were married by a judge. It was his fourth marriage. She converted to Judaism afterward. “I am a Jew by choice,” she said. She held a Torah on the bimah at the start of Kol Nidre services at Shaarey Zedek two weeks ago. Married for 14 years, they traveled extensively and spent a lot of time at a huge vacation home in Snowmass, Colo.
“People sort of look surprised and chuckle when I say that at meetings, but it’s true,” she said. She has three children, two stepchildren, four grandchildren, four step-grandchildren, a house here, the house in Snowmass and a New York City apartment. One of Ethan’s sons, William Zev Davidson, is named after Bill. “I admire Karen for many reasons, but mainly because she is completely devoted to Bill’s memory,” said Mary Petrovich of West Bloomfield, who is Karen’s golfing partner at Franklin Hills Country Club. They met while making philanthropic arrangements for their respective families at U-M. Petrovich is an adviser to the Carlyle Group, a nationally known private equity firm. “Karen is the most humble, least pretentious, intelligent, down-to-earth person I’ve ever met; she’s just a smart, engaging woman with strong Midwestern values,” Petrovich said. Karen grimaces when the conversation turns to basketball. Bill bought the Pistons for $6 million in 1974, and his succession plan made her the owner when he died. “I give myself the grade of ‘F’ as an owner,” she admitted. What would Bill have thought of the team’s poor record, coaching changes and other travails after his death? “He always had a lot of patience, especially in bad times,” Karen answered. Karen says the interesting part of being an owner was attending NBA owners meetings “with 29 billionaires in the same room, who really didn’t want to be there; they were always talking on the phone about their other businesses,” she recalled. 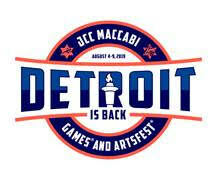 Retaining a partial financial interest in the Pistons, she sold the team and the entire Palace Sports Entertainment empire for a reported $340 million to yet another billionaire for the NBA, Tom Gores ($2.5 billion), chairman of Platinum Equity in California. He’s a Palestinian, born in Israel, but came to Michigan as a youngster. Karen became aware later of allegations that some Gores family members reportedly had made anti-Israel and pro-Hamas remarks, but “Tom was a pleasure to deal with,” she stressed. Bill was a kind man of great faith. Karen is one of the nicest & sincere people you could ever meet. The fact that she is working so hard to make sure Bill’s legacy & wishes are fulfilled is proof of their Love and that there are still good people doing good things.